Status: Contest finished on 14-01-2010. New remix contest by Potty Mouth Music. Remix the track “Jack It Like A Zombie” by The Bulgarian to win the contest! After months of waiting way too long to do this, we are now accepting applications to participate in our first official potty mouth remix contest — “Jack It Like A Zombie” by the Bulgarian. 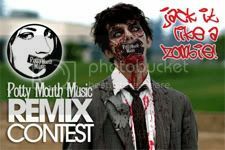 The winner of the contest will have his/her track released with the official ‘Jack It Like A Zombie REMIXED Ep’ dropping digitally online in spring of 2010. The Remixed Ep features mixes by Nom De Strip, Jason Hodges, Juan Dela Madre, Adam Bozzetto, Angel Alanis, Wally Callerio, The Bulgarian plus ONE LUCKY WINNER!